Another strong third period, another win for the Guelph Storm. 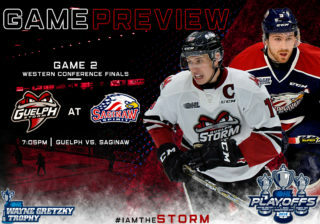 The Storm (37-25-2-2) accumulated more shots in the third period than their first two periods combined, while rookie forward James McEwan was in on both goals in the final frame as they came out with a 3-2 victory over the Kitchener Rangers (31-24-3-7) Tuesday night at the Sleeman Centre. Guelph has now scored 88 goals in third periods, 21 more than the next closest period for goals scored. Pius Suter, James McEwan, and Chris Marchese provided goals for the Storm and Justin Nichols turned away 30 shots in the victory. Connor Bunnaman and David Miller scored for the Rangers with Jake Paterson making 34 saves in the loss. The home team has now won every game in the season series between the Storm and Rangers. The game’s opening goal had something to do with Guelph, but not the kind the home team was hoping for. Rangers forward and Guelph native Bunnaman opened the scoring just over eight minutes into the evening. Bunnaman capitalized on a juicy rebound after Nichols kicked aside a shot from Dylan DiPerma, where the Kitchener forward stood alone in front before scoring. Despite three power play’s, the Storm failed to get on the board in the first 20 minutes. The Rangers owned the majority of quality scoring chances and entered intermission with 1-0 lead and a 12-6 shot advantage. In the initial minutes of the middle frame, it was Kitchener who continued to bring the pressure. Just 1:27 into the second, Miller scored off a feed from Max Iafrate to the right side of Nichols. Miller lifted the puck over the sprawling Guelph goaltender to take a 2-0 lead. It took less than four minutes after that for the Storm to get back within one. Suter cut the lead to one when he scored with a wrist shot off the right wing. Paterson got a piece of it with his glove, but not quite enough as it trickled up and over the Rangers goaltender before crossing the line. The tally was Suter’s 40th of the campaign. The Switzerland native scored nine goals all of last year. The remainder of the period played out like it should when two rivals play eachother. Physical and fast with a bit of rough stuff after the whistles. A five-minute major penalty to Kitchener’s Liam Maaskant for slewfooting near the end of the period would give the Storm an opportunity to tie the game. However, with a power play for the first 3:18 of the final frame, the home team couldn’t beat Paterson. But the pressure didn’t stop. After throwing nine shots Kitchener’s way in the first eight minutes of the third, the rookie McEwan tied the game for the Storm at 9:18. A soft shot by Ryan Foss towards Paterson was redirected by McEwan, who was cutting towards the net, and past the Rangers netminder to knot the game at two. The Storm attack didn’t stop there. Peppering Paterson with shots from all areas of the ice, Guelph took their first lead of the game with 2:25 remaining in the contest. McEwan carried the puck into the Rangers’ zone, pulled off a slick deke around a Kitchener defenceman, and dished the puck across the ice to an open Marchese. Marchese one-timed the puck into the net to score the eventual game-winner. The Storm fired off 19 shots in the third period en route to a 3-2 come-from-behind win. Final shots were 37-32 for Guelph. 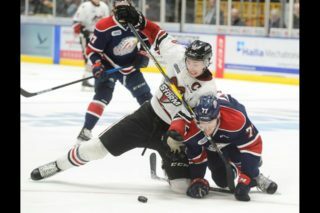 With the win, Guelph improved to 21-8-2-1 at home, while Kitchener dropped to 9-17-2-4 on the road. 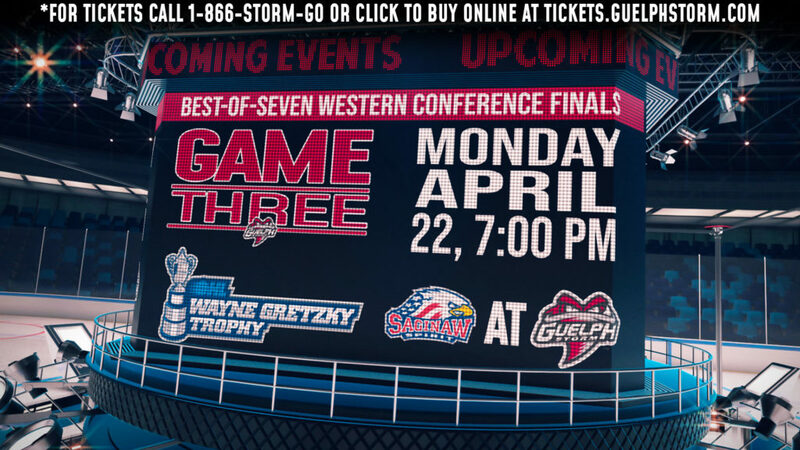 The Storm are back in action on Friday when they host the Owen Sound Attack for the final time this season. Puck drop is slated for 7:30 PM at the Sleeman Centre. – It was the first time in James McEwan’s OHL career that he recorded a goal and an assist in the same game. – The Storm have won 8 straight games at home vs. Kitchener, outscoring them 37-11. – Tonight’s game was the final meeting of the season between the two teams. The season series was tied, with each team winning 4 games. – The home team has won every game this season. 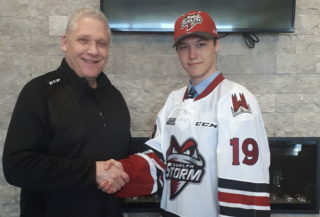 – Storm defenceman Austin Hall returned to the lineup after missing the previous 31 games with an injury. – Tonight’s game featured special one-of-a-kind St. Patrick’s Day jerseys to later be auctioned off in support of the Guelph Giants Special Needs Hockey Club. – Kitchener forward Connor Bunnaman is a Guelph native. 1st Period-1, Kitchener, Bunnaman 10 (DiPerna), 12:07. Penalties-Cascagnette Kit (tripping), 5:38; Bzowey Kit (fighting), 8:54; Carroll Gue (fighting), 8:54; Franzen Kit (interference), 13:28; Hora Kit (high sticking), 17:53; Smith Gue (inter. on goaltender), 19:39. 2nd Period-2, Kitchener, Miller 20 (Iafrate, Mascherin), 1:27 (PP). 3, Guelph, Suter 40 (Bertuzzi, Carroll), 5:14. Penalties-Allen Kit (fighting, game misc-helmet), 7:57; Hotchkiss Gue (fighting), 7:57; McFadden Gue (interference), 13:02; Maaskant Kit (match-slew foot), 18:13; Iafrate Kit (misc-usc), 19:56; Kohn Kit (slashing), 19:56; Bertuzzi Gue (roughing), 19:56. Shots on Goal-Kitchener 12-9-11-32. Guelph 8-10-19-37. Power Play Opportunities-Kitchener 1 / 2; Guelph 0 / 4. Goalies-Kitchener, Paterson 26-19-1-2 (37 shots-34 saves). Guelph, Nichols 32-19-2-1 (32 shots-30 saves). Referees-Mike Marley (31), Chris Carnegie (44). Linesmen-Jean-Francois Menard (52), John Fischer (63).